Private practice looking for an experienced Medical Assistant with experience in patient care in a private practice setting. Our well established and respected private practice needs a dedicated and self-motivated Medical Assistant to support one of ours Doctor and patients. The Doctor specializes in orthopedic surgery. Compassion and a strong commitment to first class customer service with patients and co-workers. Excellent verbal & written English language communication skills. Rooming patients, measuring vital signs, reason for visit and charting using EMR. Preparing and stocking patient rooms. Assisting Doctor with patient office visits and office procedures. Ordering tests for patients per Doctors instructions and getting insurance authorization for said tests. Other duties may be assigned by Dr. and Office Manager. ​The schedule is Monday – Friday 8:30 am to 5:00 pm. The rate of pay is $17 – 18 hr. to start. Health and dental insurance, paid holidays and vacation pay. 401K savings plan. 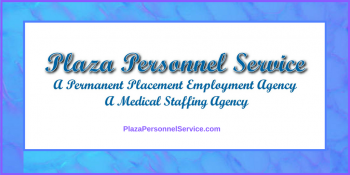 Plaza Personnel Service specializes in direct hire medical staffing for Physician offices throughout San Diego, CA. Our goal is to make a great long-term match with the employer and employee. We will listen and understand your experience, your goals and your needs. We make every effort to match the candidate with the employer so that a long and happy working relationship results. For other opportunities offered by Plaza Personnel as well as articles of interest please visit our blog at Plaza Personnel Service Blog and check back from time to time. Look for Plaza Personnel on your favorite social media site… join the conversation and stay connected 🙂 Plaza Personnel Service Medical Staffing is on Facebook, Pinterest, Twitter, and LinkedIn . Check us out on your favorite social media site.